A hearty full flavoured vegetarian option. Combine vegetables with KNORR Patak's Mild Curry Paste and roast for 25 minutes at 170 degree Celsius until tender. Heat water and CONTINENTAL Professional Gluten Free Thick Vegetable Soup Mix in a saucepan and bring to the boil, stirring continuously. Simmer for 10 minutes. Add vegetables to pan and stir to combine. Place vegetable mixture into a baking dish and top with pastry. Bake for 20 minutes at 180 degree Celsius or until pastry is crisp and golden. Serve vegetable pie with a side salad. 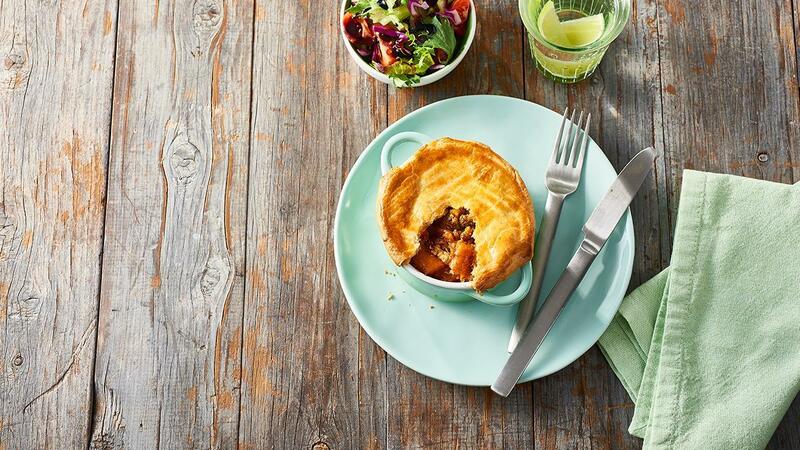 Use any of the KNORR Patak’s range of pastes in this pie such as Vindaloo or Butter Chicken Paste.